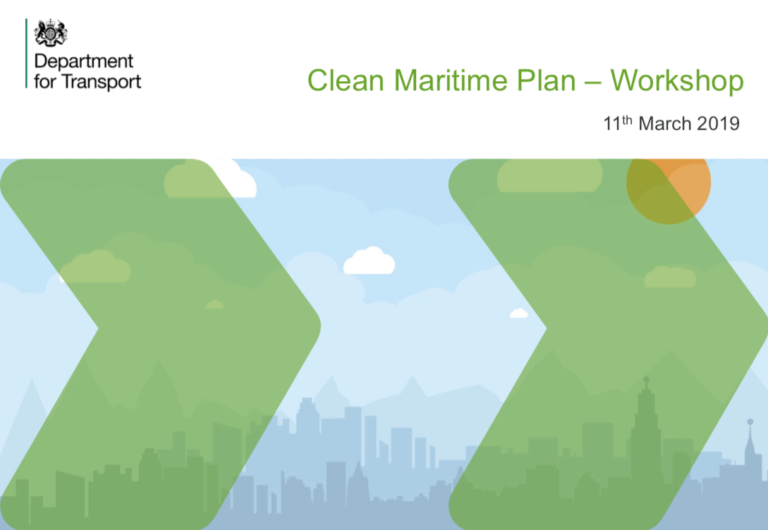 Willem van der Val form Windcat and I attended this workshop, hosted by DfT as part of their development of a Clean Maritime Plan which will be published later this year. With attendees from across the maritime industry they painted a fairly stark picture that as part of an international move to achieve Zero emissions (of Sox,NOx and Greenhouse Gases) by 2050 the shipping world has some difficult choices in the next 10-20 years but there are also opportunities to come up with some of the solutions. Possibly one of the most surprising findings was the presentation on future fuel use, which sees the reliance on hydrocarbon fuels dropping off as early 2035 due to a combination of price and pressure on emissions. There is a strong sense that the fuels of the future will be a mix of Ammonia, Hydrogen and Electricity from renewable sources. – With regard to the latter there is a clear recognition that the UK has a huge step to make to improve the capacity of the National Grid and the potential to supply effective levels of electricity to UK ports. A link to the presentations from the day is here, but we should be under no illusion that change is on the way and the UK Government are determined to be ‘in the game’ on this subject. – If not the market leader, they intend to be a ‘fast follower’ and want UK industry to be involved in and taking advantage of the technological advances they believe will come as part of the journey. They are looking at the whole maritime industry, not just the large international trading vessels – Container ships, cruise vessels and Tankers – there is also a focus on ‘domestic shipping’ which will encompass most of NWA members activities. – We will need to watch and participate positively in this debate as it moves forward. NWA will have stand PB 128 at Seawork this year – almost the same spot as last year. In addition on Wedsnesday 12th, 10:30 – 12:00Hrs, we will be holding an open Safety Forum, on the theme of “Unsafe Access for Workboats – How to Address an Industry Problem”. We will also be holding our Annual Seawork Dinner on the Wednesday evening – more details to follow next month.